England captain Steven Gerrard had to cut short training session with his colleagues in Rio on Monday because of a slight groin injury. 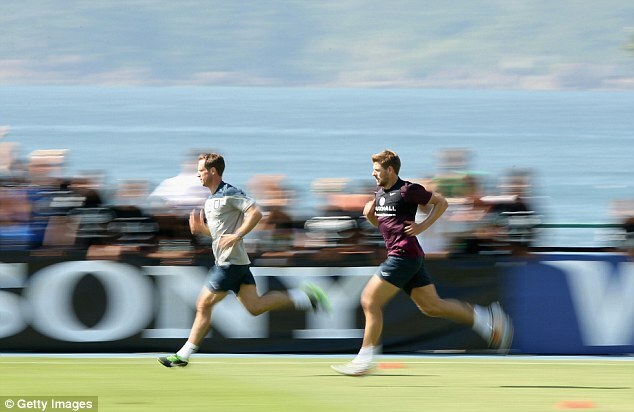 Gerrard took part in some sprints and low intensity drills under the shadow of Sugar Loaf mountain before deciding to end his session prematurely. The Liverpool captain who played the first half of England's 0-0 draw with Honduras on Saturday, admitted to a groin issue after the game with the Central American side. However, there seems to be no doubt about his availability for Saturday's World Cup opener against Italy. His injury is not believed to be serious but it will still be a concern for Roy Hodgson with England's opening World Cup game against Italy now only five days away and captain his country in Brazil, is certain to start in the heart of England's midfield against Cesare Prandelli's side. Manager Roy Hodgson and England's medical team will keep a close eye on Gerrard ahead of Saturday's game in Manaus, but his injury is only regarded as a slight problem. The rest of the squad had a strenuous session in searing heat at the Urca Military Base at the foot of Sugarloaf Mountain, a magnificent setting around 30 minutes' drive from the team hotel in Sao Conrado. Arsenal midfielder Alex Oxlade-Chamberlain continues to do rehabilitation work on the knee injury he sustained in the 2-2 draw against Ecuador, with Hodgson confident he will be ready to take part in the World Cup - even though he may miss the early stages.